When it comes to dimensioning stock, a thickness planer is indispensable. That is, unless the knives are dull or the machine’s adjustments are out of whack. Dull knives are noisy and strain the motor. Nicked knives produce a molded surface instead of a flat one. Planer misadjustments cause end snipe, tearout, chatter marks and feed difficulties. Improper planing technique also leads to poor surfacing. Until you are sure that your machine is adjusted properly, it’s hard to tell whether your planing problems originate with the tool or with the user. Fortunately, you don’t have to be an experienced machinery mechanic to install knives or troubleshoot your planer. With a little patience and the right tools, you can diagnose and tune up your own machine. To get predictable results, you’ll need two gauging devices, which will let you observe measurements that you may otherwise gain only by trial and error and by feel. First use a gauge that rests on the cutterhead to set the knives. Then use a gauge that rests on the planer bed to measure the relationships between the cutterhead and the machine’s other critical parts. 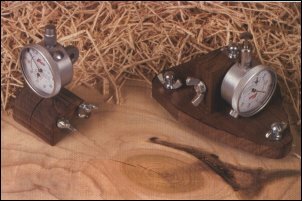 These two gauging instruments, which have been used in the woodworking industry for at least 75 years, are simply dial indicators mounted in customized bases. For up to several hundred dollars, you can buy gauges from various machinery manufacturers or aftermarket sources. 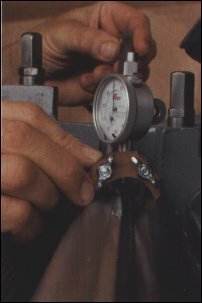 But if you need to save your pennies for another tool purchase, I’ll show you how to make your own gauges using wood (or plastic, aluminum or steel), a few nuts and bolts, and an ordinary dial indicator of the proper size with about a 1/4-in, plunger range (see sidebar at bottom of this page). The Parks planer used in this article, though it is no longer made, contains all the common features found on a thickness planer. Your model may not contain all the components I’ll address here. Even so, you should still be able to adapt the same principles to make adjustments to your own machine. As a board passes through a planer, it is influenced by the relative positions of seven different components: the knives in the cutter-head (above the stock), the bed and bed rollers (below the stock), the infeed roller and chipbreaker (above the stock on the infeed side), and the outfeed roller and pressure bar (above the stock on the outfeed side). The drawing above shows the relationships of these parts and the initial adjustment settings. Later, if I need to, I’ll tweak with the adjustments to fine-tune the planer’s cut. To understand where each of the planer’s seven components plays its role, it’s helpful to follow a board as it’s being planed. First the wood is placed on the planer bed and fed by hand between the infeed roller and the front bed roller. The powered infeed roller grabs the wood and drives it beneath the floating chipbreaker and under the rotating cutterhead. Next the board passes under the pressure bar and out between the powered outfeed roller and the back bed roller as it exits the machine. Having any of these components out of whack will cause problems, so checking each is essential. Start by setting the knives in the cutterhead. But before you do anything, prepare the machine, and get the tools you’ll need. First, unplug the machine. You’ll also want to disconnect the dust boot to gain better access. Then remove the guard from the pulley, so you can advance the cutterhead. Besides the dial-indicator gauges, you will need a few other tools: an ice pick (or other device to pry up the knives), a wooden block and a mallet to tap the knives down, and Allen wrenches to tighten the lock shim and to turn the jackscrews (if your machine has them). Study your owner’s manual so that you will know how to adjust the components on your particular machine and gather the required wrenches. Some metal shims may be handy for fine-tuning adjustments. Depending on what you find once you get into the job, you may also need a file, some emery cloth, and solvent and lubricant. And make sure you’re comfortably seated. When setting the knives parallel to the cutterhead, remove and re set one knife at a time to avoid distorting the head. This requires a spare sharpened set of knives. I always have my knives sharpened at a professional sharpening shop. If knives are being installed on an empty cutterhead, then lightly install all the knives, and go from knife to knife, gradually increasing pressure. For maximum support and safety, the knife should be as far down in the slot as practical. (For more on setting knives in a round cutterhead, see FWW #103, p. 86). There may be differences between cutterheads, too. Some have jackscrews, or there may be two knives in the cutter-head instead of three (see the drawing detail on the facing page). To check if your old planer knife is a safe size after resharpening, remove the lock shim (also called a lock bar or gib) from the cutterhead, and lay the knife about where it should be. If you see any light through the setscrew holes, reject the knife; it is too narrow and could be thrown from the cutterhead. Don’t exert a lot of force on the setscrews, or you’ll distort the cutterhead and the screw threads. Apply equal torque on the screws to get uniform pressures and deflections. I get enough leverage from the 6-in.-long leg of my Allen wrench. It’s a good idea to lay a rag over the exposed blade to protect your hands in case you lose your grip. A cutterhead gauge enables knives to be set consistently to within one or two thousandths of an inch. The wing nuts on the base allow plunger height adjustment. To use the cutterhead gauge, I lightly tighten a knife close to its proper height. This varies from machine to machine, so you should check your owner’s manual for the recommended height. I then clamp the dial indicator’s 3/8-in.-dia. shaft in the wooden base so that when the base is rocked on the cutterhead, the dial will move only about .015 to .020 in. At this point, I turn and lock the moveable dial face, so the indicator’s hand points to zero when the plunger tip is moved over the tip of the knife (see photo above). Now the indicator will register the height of the knife edge relative to the cutterhead. Gauge helps to anticipate knife shift - Using the planer cutterhead as a reference, Vaughan reads the gauge over each setscrew to know whether to raise or lower the knives and to anticipate how much each of the knives will shift during tightening. Lightly tighten the setscrews on the outer ends. I usually snug the left side to exact position, go back to the right side and raise or lower that side of the knife to where it should be, and lock it in po­sition. Then working from left to right, over each setscrew, I either raise or lower the knife until I can lock it at the proper height (see photo above). Rocking the indicator’s plunger over the knife edge shows me the maximum protrusion of the knife edge. Keep in mind that the wood of the gauge base is light and sensitive. Take a few minutes to get the correct feel of the gauge base contacting the round cutterhead. Repeat the sequence—one knife at a time— for the other knives in the cutterhead. Once the knives are set, install the indicator in the other base with the plunger tip up. Drop the planer’s bed until the bed-resting gauge can be easily placed directly beneath the cutterhead. Crank up the bed until the plunger tip just touches the bottom of the cutterhead. Be sure the cutterhead has been rotated so that the knives are out of the way. Then place the gauge at one end of the cutterhead, and rock the cutterhead as you zero the dial at bottom dead center. Zero the other end of the cutterhead as well. Brush the plunger under the center of the cutterhead. If there is a sizable difference (more than .015 in.) between the middle reading and the ones taken from the outsides, then the bed has been worn too much and needs to be re-machined. The bed—The planer bed and cutterhead should be parallel. How to make them parallel varies from machine to machine. Some machines require the table be adjusted and others require the head position be adjusted. For those machines that have no adjustment, the only option is to set the knives in the cutterhead, so they will be parallel to the bed instead of the cutterhead. Before working with the dial indicator, make sure that the bed has no slop in it as it moves up and down. Most machines have wear shims that can be adjusted. A sloppily fitting head or bed will give poor surface results, such as snipe and washboard. Defining the cutting arc — Using the cutterhead gauge again, double-check (over each setscrew) the positions of the knives in the cutterhead. Final setscrew tightening often causes the knife to squirm up a hair. Then position the indicator back in the bed-resting base so that the plunger is at bottom dead center of the cutterhead. Lower the table without disturbing the position of the gauge base. Rotate the cutterhead by hand until one of the knives is at bottom dead center. Carefully raise the table until the plunger tip just touches the knife. Reach in and steady the position of the base while raising the bed just enough to make the knife move the plunger about .015 in. Zero the dial when the knife rotates through bottom dead center of its arc (see photo above). This defines on your gauge the lowest point of the cutting circle. This will be your datum. It is this plane that defines the position of the planer’s upper internal components. Neither the bed nor the cutterhead positions should be disturbed while making the rest of the upper adjustments on the planer. The infeed roller — Straddle the bed roller slot with the feet of the gauge base, and move the indicator in and out under the infeed roller. The position for serrated steel infeed rollers should be about .030 to .035 in. below the cutting arc for most machines. Rubber rollers will be slightly lower. For sectional infeed rollers or chipbreakers, you’ll have to average the measurements. Consult your manufacturer’s literature to get an exact figure of the correct position in relation to the cuffing arc. When adjusting the infeed roller to the correct position, the face of the indicator may not be in the most convenient spot for view­ing. If this is the case, cut a triangular block of wood about 2 in. high, and fasten a mirror to it with double-faced tape to view the results when standing above the planer. This mirror can be used for the other internal components as well. The chipbreaker —Like the leading edge of a handplane’s cap iron, the chipbreaker in a planer prevents long tearouts from occurring. The chipbreaker is often, but not always, set to the same distance below the cutting arc as the infeed roller. Proper alignment keeps long strips of wood from lifting as the top of the board is being cut by the knives. Set the chipbreaker to manufacturer’s specifications using the gauge in the same way it was used to set the infeed roller. Some machines have anti-kickback fingers or pawls just ahead of the chipbreaker. The pressure bar —The pressure bar is located behind the cutterhead and keeps the newly cut surface from bouncing up into the cutterhead as the stock enters and exits the planer’s feeding system. During the cut, it performs a hold-down function when feeding warped stock. If it is set too high, the wood will flutter and a washboard texture will result. And it’s likely that end snipe (a slightly thinner section) will occur. If it is set too low, feeding will be impeded. A majority of surfacing problems can be traced to this component, so its position is critical. I normally set a pressure bar about .002 to .004 in. 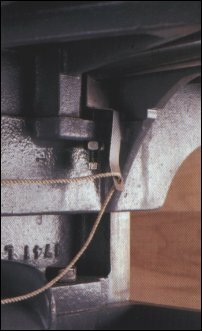 above the cuffing arc for surfacing face-jointed lumber. For surfacing lumber that is rough on two sides, a slightly higher setting usually works well. The outfeed roller —The outfeed roller is usually smooth or rubber-coated, so it won’t mark the planed surface. Set the outfeed roller exactly like the infeed roller. It should also be set to the same distance below the cutting circle, unless the manufacturer’s instructions state otherwise. The planer bead gauge has to work in different positions. The base screw can straddle the bed slots. To check the feed rollers, orient the dial indicator, so it can take overhead reading. To check the bed rollers (shown here), flip the indicator on the tool post, sticking the plunger down through the hole in the base. The bed rollers — The bed rollers reduce friction as stock is being fed, and they prevent premature wearing of the bed tables. So, it’s important that the rollers turn easily and are aligned precisely. 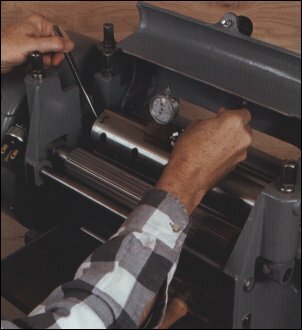 Bed rollers are located in slots in the bed directly below the two feed rollers. The dial indicator will have to be reinstalled in the base with the plunger down to check the position of the bed rollers (see photo above). Adjust the feet so the plunger moves up only about .015 in. when the base sits on the bed. 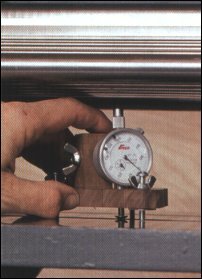 The weight of a wooden base is often not enough to overcome the opposing spring pressure of the indicator’s plunger, so hold the base down for accurate readings. Temporary bed-roller shims make heavy milling easier. When Vaughan want so do heavy planing, he elevates the bed rollers with temporary shims. This is easier than having to adjust each end of both rollers individually. The shims, tethered on a string for convenience, are removed when it's time to do finer surfacing. The rougher the lumber, the higher the bed rollers should be set to reduce friction. However, if they’re set too high, the workpiece may vibrate, producing a rippled surface. Conventional practice is to set the rollers .002 in. above the bed when dressing faced lumber and about .020 in. when dressing lumber that’s rough on both sides. On this machine, I set the rollers to .002 in. and then insert .020 in. shims on those rare occasions when I’m dressing lumber that’s rough on two sides (see photo above). Machines with no bed rollers don’t usually have performance problems related to the lack of bed rollers. But the beds don’t stay flat nearly as long either, and the motors work a bit harder. The dimensions I have shown are those I use for a starting point when adjusting planers and are far from being written in stone. Other factors such as component wear, wood dryness, wood straightness and operator preferences can easily dictate that things be adjusted differently. Adjustment problems — Adjustment screws on planers usually are held in place with locknuts. When the correct settings are reached by turning the adjustment screw, those settings usually alter when the locknut is tightened. Its always a good idea to watch the indicator’s hand when the locknut is tightened, so the setscrew can be turned to compensate for the difference. 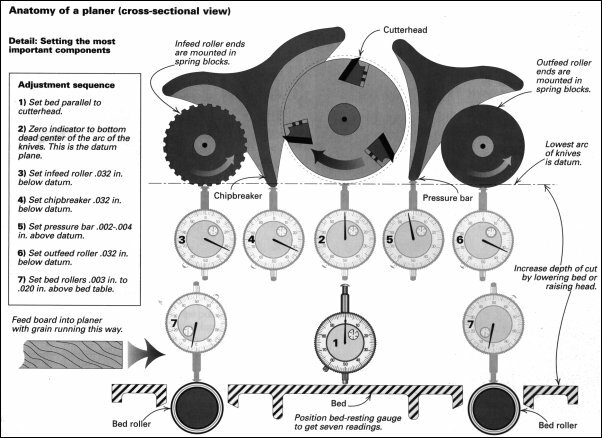 Spring pressure — Downward spring pressure can sometimes have an effect on planer performance. A heavy spring can emboss infeed roller prints on softwood when making that light final pass. Light pressure can cause roller skidding when rough or warped lumber is dressed. How much is enough? Only the performance of your machine will tell you that. Safety — Because planers pull the wood away from you, loose clothing and jewelry can be a hazard. Noise is also a factor. When knives get dull, they loudly beat off the chips rather than cut them. So always wear ear plugs in addition to eye and breathing protection. Try to cut out defects such as knots beforehand, and never plane a board that’s less than ¼ in. thick or shorter than the distance between the feed rollers. Any cutterhead that is moderately exposed on the outfeed side should have a shroud over it to prevent easy access to the spin­ning knives. Drive belts and gears should also be covered, so you don’t come in contact with such moving parts. Last, never look into the machine (infeed or outfeed end) when it’s running. The proof of proper planing is all in the shavings. The proof of proper planing is all in the shavings. When a planer is producing long, clean shavings and little dust, chances are good that the machine is well tuned. The smooth, tearout-free knot on this planed board of poplar shows that it's well worth the fuss of using dial-indicator gauges to install knives and set planer components. Dust collection — Though this machine was not shown with a dust collector, for best planing results, as well as for health concerns, you should have a dust- and chip-evacuation system. Chips can pile up and get pressed into the wood under the outfeed rollers and get dragged around by the knives. This makes for little dents on the wood that will eventually spring back as little bumps when the wood takes in more moisture. Ideally, your planer should produce long, clean shavings (see photo above). 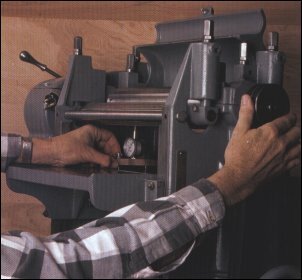 Planing for success — Planer-operator technique can have as much to do with poor surface quality as a poorly adjusted machine. For example, slower feed rates tend to produce smoother surfaces. And hardwoods generally should be fed slower than softwoods. Also, keep these guidelines in mind when you are planing: Not supporting long stock as it enters and exits the plan­er will almost always result in a snipe. Trying to surface warped stock will usually cause a washboard surface because the wood is not flat on the planer bed. Taking too heavy of a cut can cause tearout; feeding the wood against the grain will cause tearout; and dressing knotty or highly figured wood increases the risk of tearout. Not taking a light final pass to get to finished dimension can result in a rough surface. High moisture content in the lumber makes the fibers stringy and difficult to cut cleanly. The result is a fuzzy surface. It also will likely be a bear to feed properly. Finally, a planer smooths stock and makes the faces parallel. It will not straighten warped stock. My shopmade gauges were adapted from the heavy steel gauges I service planers with in the field. For occasional use, the shopmade gauges give equally precise readings. I devised the gauges so one dial indicator can be interchanged from one base to the other. Because planer dimensions vary, the bases’ measurements will also vary. To size them, first get the right dial indicator. 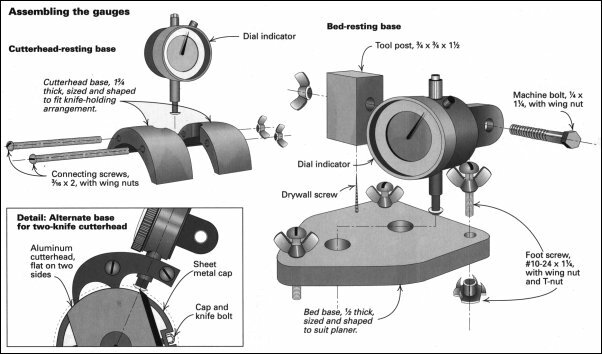 Selecting a dial indicator: A dial indicator is excellent for showing crucial relation­ships of machine components. One of the inexpensive imported units goes for about $25 (Enco Manufacturing, 5100 W. Bloom­ingdale Ave., Chicago, Dl. 60639; 800-873-3626). After you thoroughly study the parts of your planer and all its adjustment limits, sketch a full-scale cross section of these. This will help you choose a dial size and also show you how the bases need to be shaped. Select an indicator that will fit easily and can be read dearly in your planer. I use a 1¾-in.-dia. dial with a 3/8-in.-dia. convex replace­ment tip, like Starrett’s or Mitutoyo’s hardened, chrome-plated type. Convex tips provide better contact over a knife. Making the bases: To make the cutter-head-resting base, first make a full-size sketch of your cutterhead. Extend a line from the center of the cylinder out over the tip of a knife. Position your indicator over the line with the plunger pointing at the center of the cutterhead. Next draw a base profile with two feet resting on the cutterhead. For two-knife cutterheads, try making an indicator base that has both feet on one side (see the drawing detail above). Mark when the plunger stem passes through the base Then transfer your base profile to a block a wood, and drill and cut to size. Using the hardware shown, assemble the gauge. For the bed-resting base, make a crow’s foot (tripod) arrangement. The position of the screw feet should be such that the feet won’t drop down in the bed-roller slots. Use the planer sketch to locate the indicator tool post. I devised mine so that I can swap the indicator from the front to the back of the post. Finally, round and polish the bottoms of the base’s screw feet. -R.V.